Can you learn in seminars how to have a sense of humour? There’s no need to, because everyone brings their very own sense of humour, their own humorous fingerprint with them when attending our events. But you can certainly take a closer, more intensive look at humour. Our participants often wish for more humour in tense situations, when giving difficult feedback or resolving conflicts. 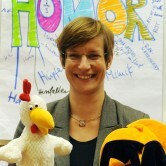 In the seminars of the German Institute for Humour, you learn to differentiate between appreciative and hurtful humour. Of course, we also offer classic seminars for improving communication, presentation, visualisation and conflict management. 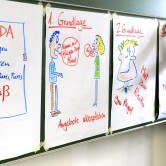 The seminars of the German Institute for Humour are dynamic, well-founded and, of course, humorous. We laugh, we think things through, we try things out. You hardly notice the time go by. Afterwards, you can add specific techniques and practical examples to your repertoire. This entertaining and well-founded training is concerned with the nuances of the healing effects of humour – regarding a company’s working atmosphere and the productivity of its employees. This training format focuses on effectiveness in everyday life, be it in presentations, keynotes, sales pitches or business meetings. The right choice of words and appropriate body language can prevent misunderstandings and get your message across more effectively. The goal is to clearly communicate your needs and to address what is obvious. 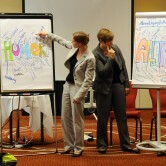 This training also introduces humour as the magic ingredient for skilled speakers. More spontaneity at the right moment! Team spirit, open-mindedness, flexibility, the ability to learn, creativity – everyone needs these skills nowadays. Techniques from improv theatre are perfectly suited for remaining flexible and mentally agile in your communication. This spontaneity training teaches you methods for high flexibility and spontaneous agility in your day-to-day life. Your ideas are great, but nobody knows it! Selling skills are also required outside the context of direct customer contact. Every time you present a concept or try to convey an idea in a meeting, there will be some form of resistance or opposition. The aim of this training is to foster flexibility and explore possibilities for action when faced with resistance or opposition. Using body language skilfully is useful here, as is the ability to react spontaneously to unexpected and unfair attacks. Appreciative humour is more likely to help an idea succeed than cynical replies.